Plastic frame measures 10" x 10"
Molded plastic skeletal hand measures approximately 4" x 6"
Label below hand identifies it as "Skeleton Hand, Ossa Hominum Manu"
Do you need more accessories for your haunted house? Well, nothing says spooky like having human bones framed and hanging on your wall, right? 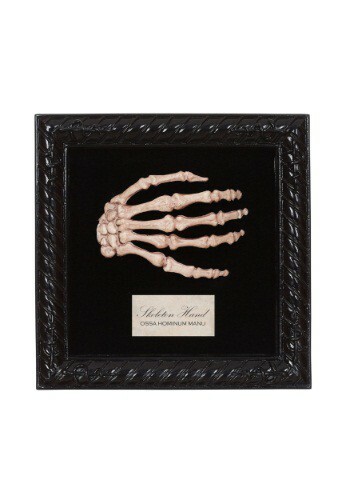 Turn a section of your home into a creepy trophy room or an evil laboratory when you start by decorating it with this Lab Specimen Skeleton Hand. Are you following in the footsteps of the late and great Dr. Victor Frankenstein or are you just a fan of hunting down the most dangerous game. Whether you're reanimating the dead or hunting down the living, your guests will all be terrified when they see your collection of skeletal remains lying around your lair. Start with this bony hand hanging on your wall and take a look at the rest of our skeleton/body part props. Add replica limbs hanging from your ceiling on chains, a bundle of bones in one corner and a bag of more in another, and don't forget to set up plenty of animal skeletons all around. Dogs, cats, birds, we got them all and they are all ready to send shivers down the spines of your friends and neighbors!